I was watching “Master Chef” the other night(yes, I watch too many cooking shows). 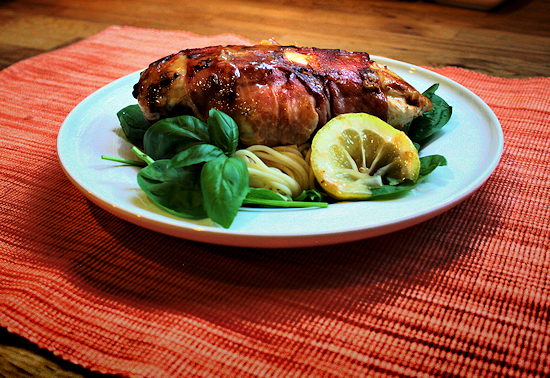 It was Joe Bastianich that made the comments about the stuffed chicken which made me want to try it. If you have read my blog at all, you know I am not crazy about chicken but I am always up for trying something new to make me like it more. This was good enough to get me to change my mind. Joe said the chicken should be cooked to perfection, still juicy and tender with flavor. Above all, cheese should be pouring out of the center. Well, that was it! He said cheese in the middle and I was sure I was making this. My love for cheese is fairly obvious, isn’t it? Oh, well! 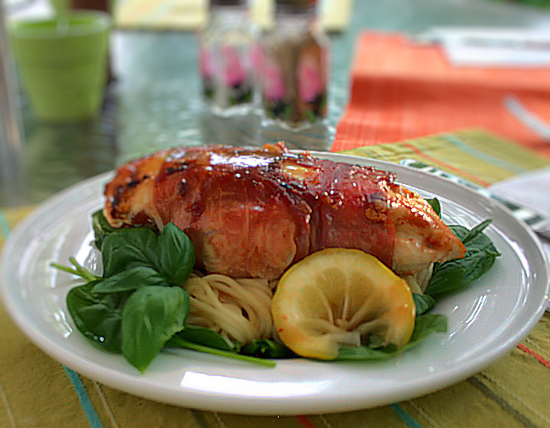 This chicken was very easy and absolutely bursting with flavor! 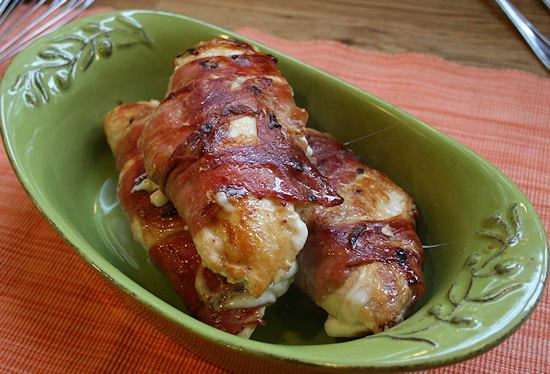 I hope it makes you chicken doubters enjoy chicken just a little bit more as well. 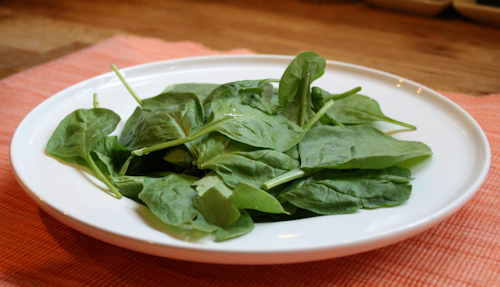 fresh spinach for bottom of plating. Comes in 1lb bags, cleaned and ready to use. There’s enough for at least 5 servings in a bag. 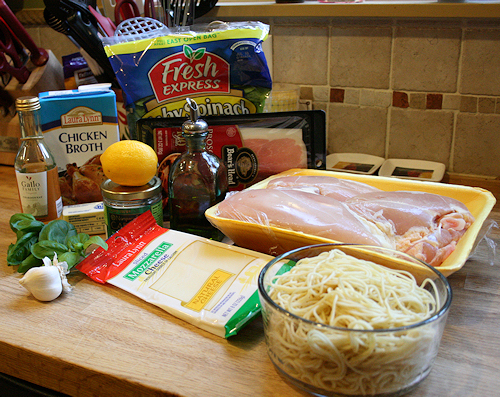 First thing is to get the chicken prepped and ready to stuff. 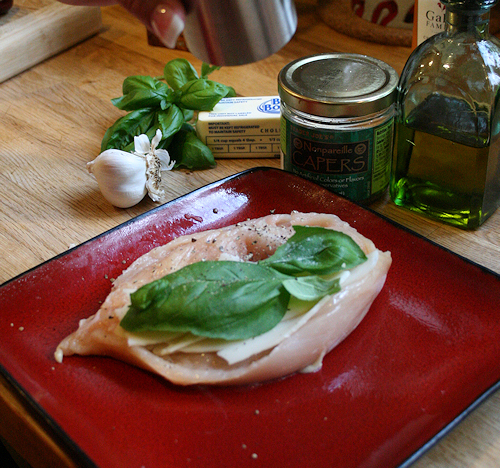 Rinse each piece of chicken. 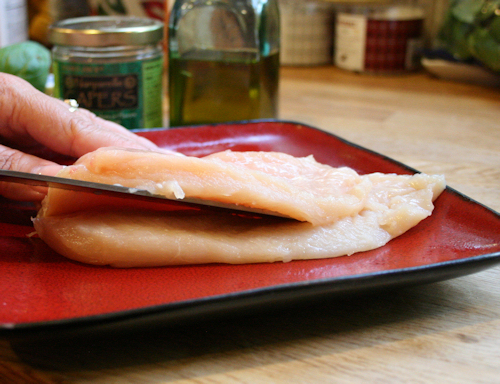 Lay the chicken on a clean plate and use a sharp knife to carefully slice evenly through the middle or create a pocket. 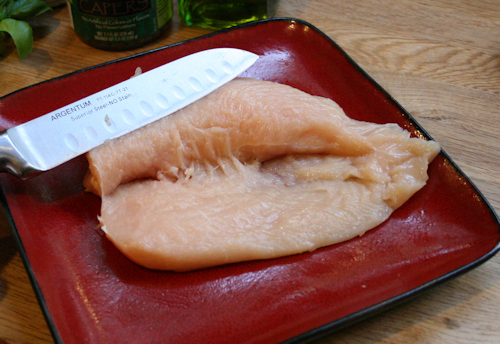 Make sure not to slice all the way through, separating the chicken. When each piece is cut, they are ready to stuff. 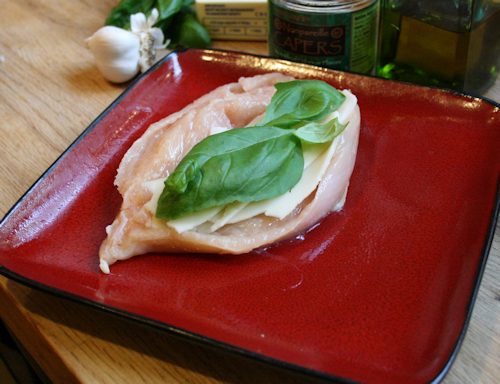 Open up the breast so you can place the cheese and basil inside. 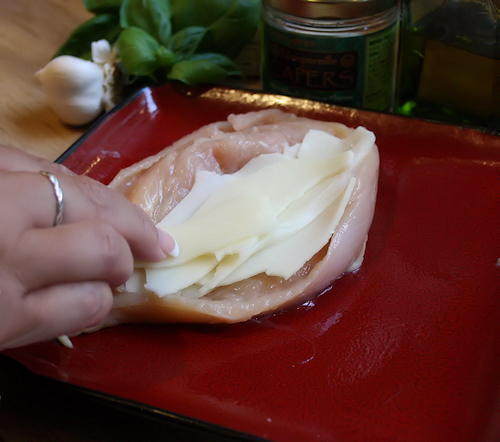 Add one slice of mozzarella cheese in each or if shredded, follow measurements above. I ripped the piece up so I could layer it evenly. 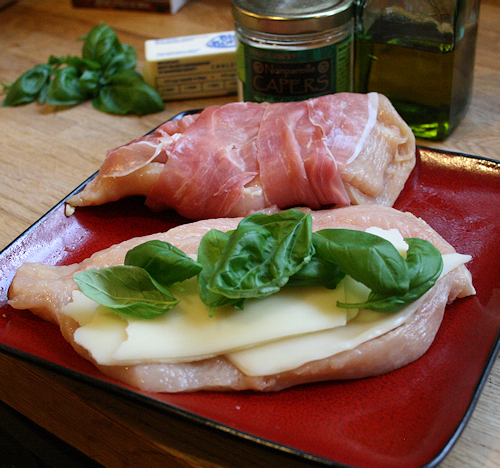 Now, add fresh basil leaves. I like to add about 5 to 7 leaves in each, but you just add to suit your taste. Sprinkle or grind in some fresh pepper and salt. 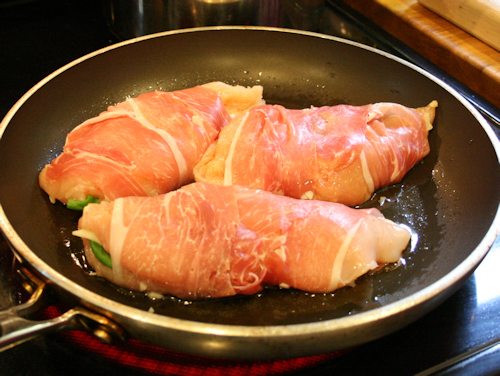 Not much, as the prosciutto will add some salt to this dish as well. 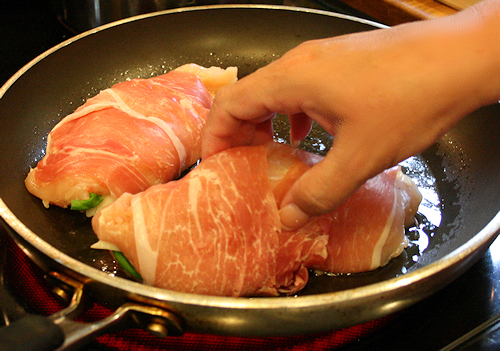 Fold over the chicken top and close. 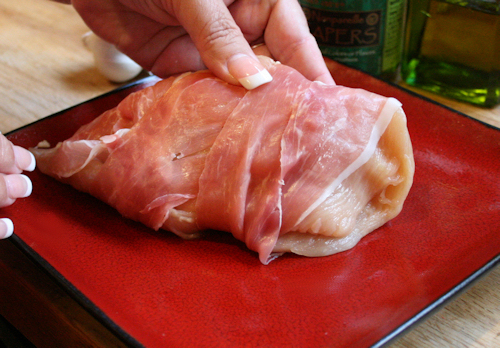 Grab two pieces of sliced prosciutto and wrap around the breast. It does not need to be tight. It will stick on its own. When done, set aside and get your pan ready. 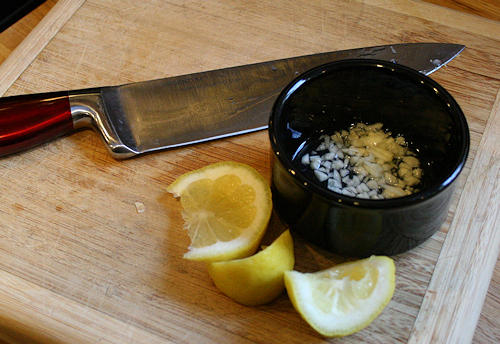 Chop your garlic and add the squeezed lemon juice(or 2 tbs of juice) to a ramekin. Add the olive oil and half the garlic and lemon from the ramekin into the pan and heat. 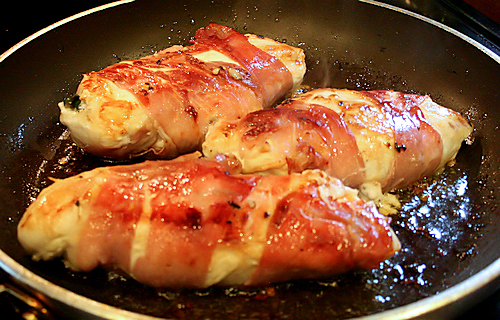 When the oil is hot, add the chicken into the pan. 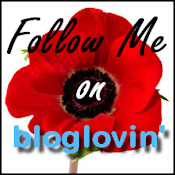 Just writing this has me wondering when I am going to do this again and who am I going to invite to try it with me. It was just that good. After about 7 minutes in the pan on medium heat, turn them over. Cook for another 7minutes on this side and then flip again for an additional 7 until cooked through and the prosciutto is nice and crispy. 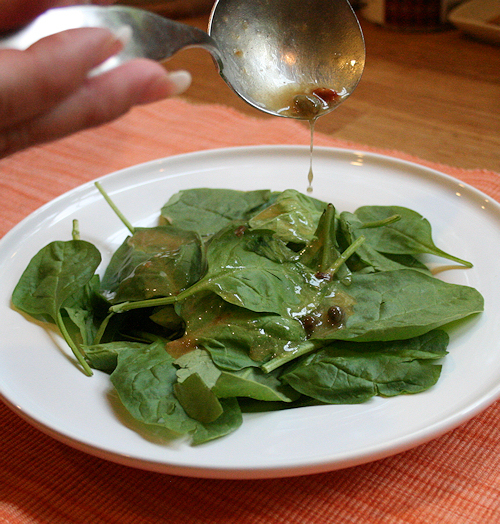 When done, remove, place in a dish and set aside to do a quick pan sauce. Pretty, huh? 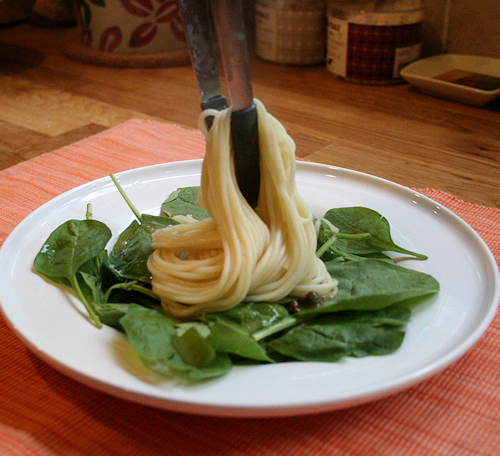 I chose to put mine on top of fresh spinach and pasta. 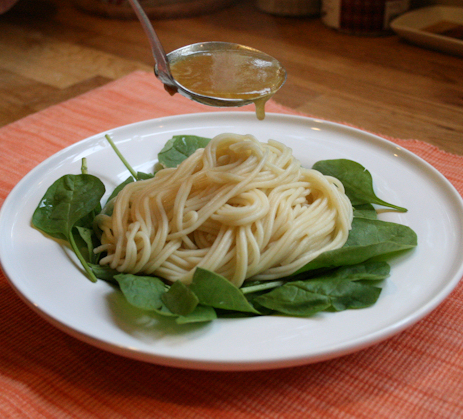 I love pan sauces and pasta. 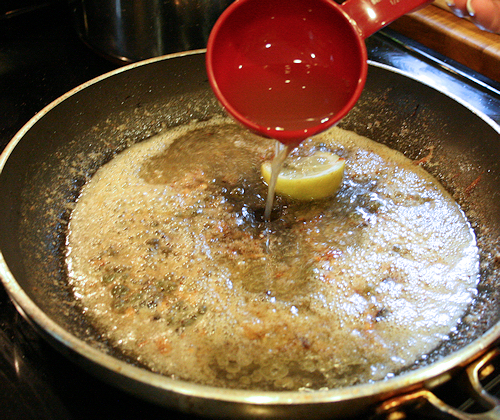 While the pan is still hot, add the tbs of butter, remaining lemon and garlic to the chicken drippings. Just look at those yummy bits! 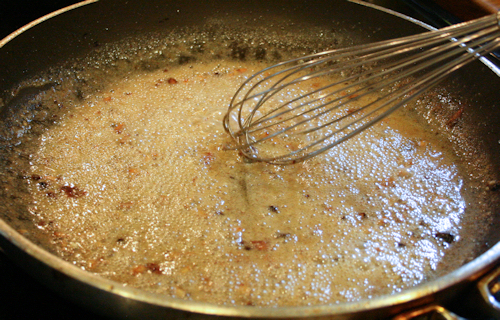 When the butter melts, add your cornstarch and whisk it in together, making a loose rue. Once the corn starch has dissolved, you will be able to see it thicken some. 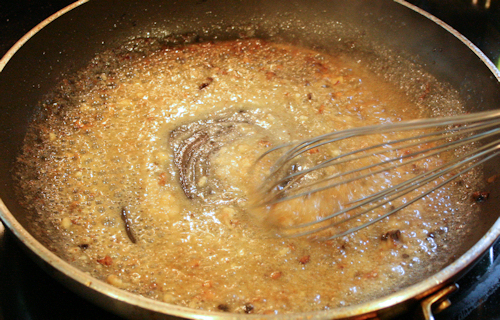 This will not be a gravy, just a light pan sauce for the noodles. 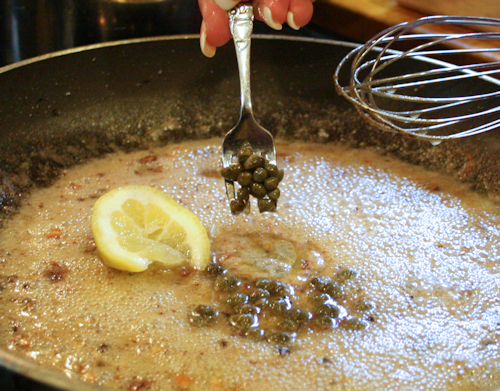 Add the capers and throw in a slice of lemon if you have any left over. I just liked the way it looked and thought I would use it for a garnish later. Now the wine. Yes, I’m just pouring it in! I can eyeball these things. Really I can. Scout’s honor. 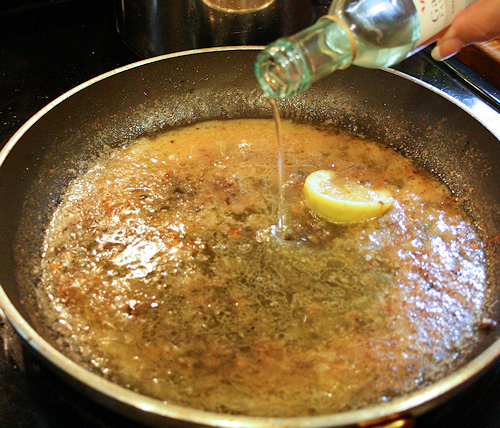 Let this simmer for about 3-4 minutes and it will thicken just a little. 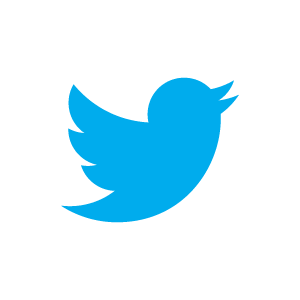 While this is doing it’s thing, prepare for plating. 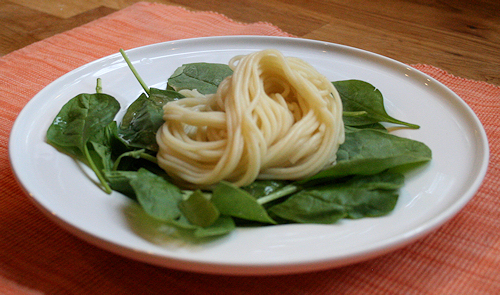 I chose to add fresh lettuce and I let the hot noodles and sauce cook just to perfection. Not limp and soggy but bright and still a little crisp. Loved it. 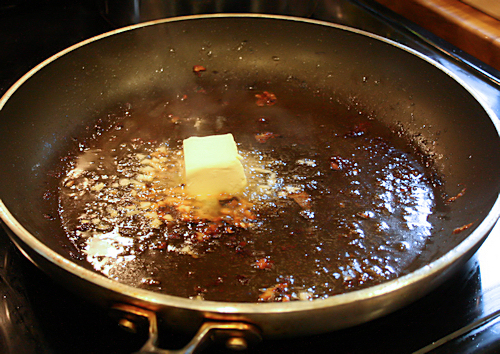 Add some of that beautiful pan sauce. 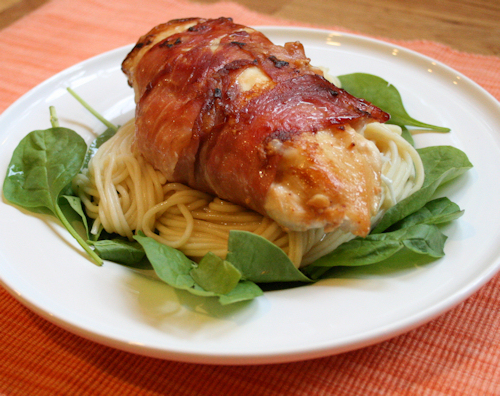 Then that beautiful piece of chicken. Perfect for a night out on the deck. I’ll leave the middle a surprise for you, but I will tell you this. It was pure heaven!